Here is a pizza that I rustled up last night. Home-made pizza dough. Baked on a pizza stone. With ham, sopressa capsicum, confit garlic, basil and mozzarella. A tribute to the very resourceful Russell. Excuse the pun. 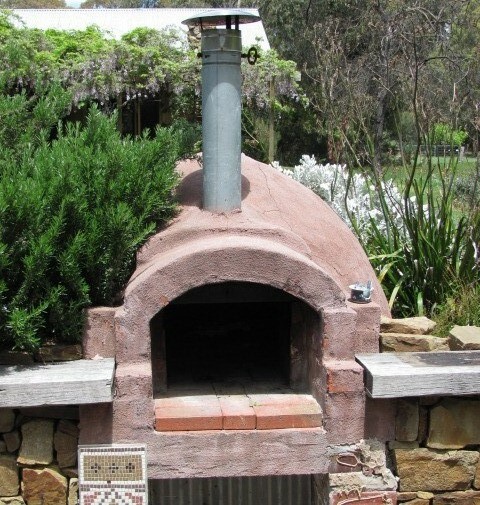 Here is Russell’s beautiful wood-fired pizza oven. In the garden surrounded by lavender and rosemary bushes. I was so looking forward to my visit to Wattleflat, and dreaming of the wonderful, wood-fired pizzas we were going to bake. In that very oven. I even made up a batch of confit garlic to bring with me as a token of gratitude. Alas, the weather and the baggage handlers at Sydney Airport conspired against us. Temperatures dropped to an unseasonable 7 C . The cold and accompanying rain were certainly not conducive to an evening in the garden assembling and baking pizza. And my jar of Confit Garlic? Smashed by the baggage handler as my hand luggage passed through security screening at Sydney Airport. Fortunately, I had double bagged it. Unfortunately, I was blissfully ignorant of the fate of that jar until a faint garlic odour permeated the cabin mid flight. Apologies to any fellow Qantas travellers who may have noticed and wondered exactly what that funny smell in the cabin might have been. We still baked pizza that weekend. Sans the Confit Garlic and under cover of the eaves of the verandah on pizza stones on the gas fired barbecue. And here is Russell’s barbecue. There are one or two things worth noting in this picture. On the griddle there is a conventional round pizza stone. But have a close look at the hotplate. Those terracotta paving bricks, straight out of the garden, are Russell’s preferred pizza stones. They make wonderful pizza. Almost as good as those that I would imagine the wood fired pizza oven produces. Russell’s resourcefulness, however, doesn’t stop at those paving bricks. Take a close look at the pizza paddle. I am reliably told that Russell baulked at the $70 price tag attached to the more conventional pizza paddle available at the local hardware store. So he came home, rummaged around in his man shed and fashioned his very own pizza paddle out of a piece of old tin and a discarded broom handle. That kind of ingenuity deserves to be applauded. So here’s my take on pizza. Russell style. Made with home-made pizza dough and sauce. And confit garlic of course! You will need to start making the dough at least 2 hours before you need it. You can make it the day before or even earlier if you like. DIVIDE the dough up into as many little balls as you want to make pizzas – this amount of dough is enough to make six large or eight medium pizzas. Give each ball of dough a quick knead and let them rest for about 15 minutes. These are your pizza bases, ready to be cooked or frozen in zip lock bags for future use. Dust each ball of pizza dough lightly with flour. Pat into a disc and flatten with the heel of your hand. By hand continue to gently stretch the dough into a 10cm or 12cm round. Working from the centre of the disc, press the dough outwards from the centre. Rotate the dough to form an even circle. 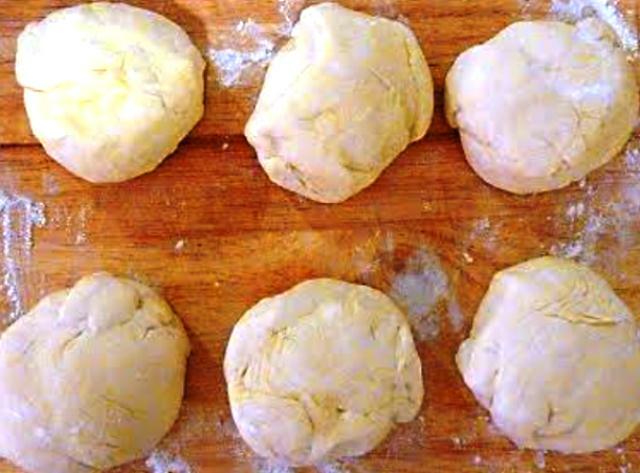 Using a rolling pin, roll the circle of dough to desired size and thickness. If you are making large quantities of pizza you can pre stretch the pizza dough. Make your dough and roll your pizzas bases out well in advance. Stack them on a tray or a plate, one on top of the other, pancake style, with baking paper between each layer. Seal them with cling wrap and refrigerate. Remove from the refrigerator 20 minutes before use. Flat plate and long handled spatula (or pizza paddle if you have one) on which to assemble the pizza and use to transfer the pizza to and from the stone. 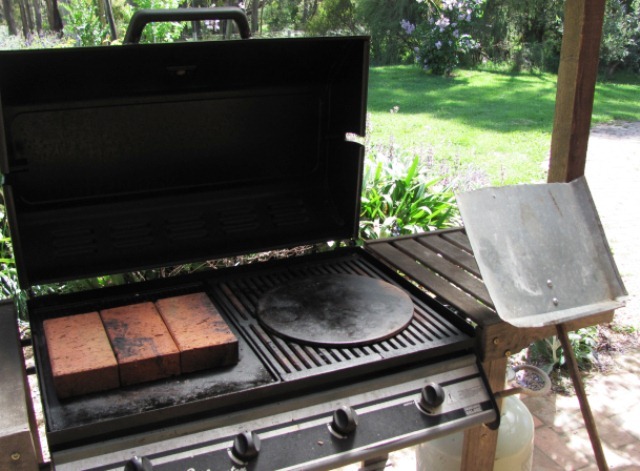 POSITION the cold pizza stones or unglazed tiles on the BBQ plate. PRE-HEAT the BBQ with all burners on high until the temperature reaches 200 C to 250 C degrees. This will take about 30 minutes. DUST the preheated pizza stones with a little flour or semolina. PLACE your home made rolled or stretched pizza base onto a floured flat plate or pizza paddle. WHEN you are ready to cook the pizzas adjust the centre burners to low, i.e. the burners are directly under the hot plate to avoid high, direct heat under the pizza stones. TRANSFER the pizza from plate (or paddle) to the hot stone with a quick jerking action. Do not touch the stone with your hands. It is extremely hot and you will burn yourself. CLOSE the lid of the BBQ and cook the pizzas, until crust is golden brown and topping hot and bubbly. Home-made pizza dough will cook in 10 – 15 minutes with the lid down. REMOVE the cooked pizza from the stone with a paddle or long handled spatula. Leave the stone in the BBQ and do not attempt to remove until it is completely cold. HALF AN HOUR before baking place the cold pizza stone or tile in the oven or BBQ and preheat to a minimum 200 C, preferably 250 C, as per detailed instructions above. LIGHTLY dust work surface or plate with semolina. SPREAD tomato sauce and mashed confit garlic cloves all over the prepared pizza base. 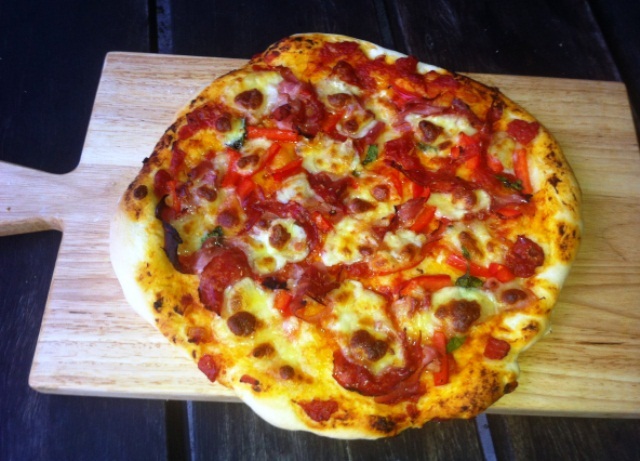 SCATTER with ham, sopressa, capsicum, basil and mozzarella. PLACE on preheated pizza stone. BAKE for 10-15 minutes until base is golden and crisp. This entry was posted in Pizza, What I Love to Cook and tagged Basil, Food, Garlic, Ham, Italian, Mozzarella, Pizza, Recipe, Salami, Sopressa, Tomato. Bookmark the permalink. Thanks. Or perhaps it is I who should thank Russell. Those terracotta tiles have completely transformed my BBQ into a pizza oven. I want to be russel’s friend!